Last night, “my” feral cat didn’t show up for her supper. With a younger cat, or in better weather, that wouldn’t mean much, but given that by all reports she’s at least 15 years old and her heath has been failing lately, I have a sinking feeling she won’t be back. From what I can gather about her life, she was brought by a farmer, to be spayed, to the vet clinic that at that time was around the corner from my apartment building, and escaped as soon as he opened the truck door. Katherine, the superintendent at the time, along with others in the building, began to take care of her. She had at least one litter of kittens before she could be caught, possibly three or more. At some point, the kittens from at least one litter were found homes, and PussPuss herself was taken to the vet, where she was vaccinated and spayed. A home was found for her, but she was so agitated indoors that she was released again. For over a decade since, she’s been living in this area. Katherine continued to feed her daily. This building has parking for four cars under each corner of the building, and PussPuss’ food was left there, along with bedding to make her a comfortable place to sleep — most of the time. Katherine developed health issues in May 2007, and asked me to look after PussPuss for her, neither of us expecting that she would be unable to continue the job herself at all. I wasn’t sure she’d make it through last winter. I set up a kind of lean-to for her in the most sheltered corner of the parking area, made of pegboard leaning against the wall and draped with blankets, and made her a bed inside. She got through the winter. And through this past summer, though the building manager told the new super that the blankets had to go for the summer. When the weather got cool, I put blankets back down. When it got cooler, I rebuilt her shelter. She’s been losing weight, and her winter fur never came in. Recently, her appetite’s been decreasing, and she’s had diarrhea, often in her bed overnight. So, I’ve been changing her blankets daily, tempting her with tuna water and catmilk… someone else in the building takes her salmon every morning, and says she’s seen her more active and alert during the day. I know she’s been showing signs of arthritis (?) in her right foreleg. She’s been very aware of suppertime, hasn’t missed one in weeks. Usually she’s either in her house or waiting by the food dishes for me. Last night, she wasn’t there, and it was quite cold. I couldn’t find her anywhere nearby, and usually she doesn’t go far. This morning, her house showed no sign of her having slept in it. That can’t be a good thing. How could a 15+-year-old cat in poor health survive the cold — and why would she not come back to her home of many years, unless she couldn’t? 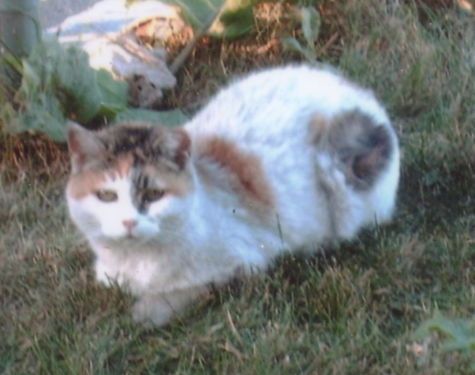 I’m hoping she reappears for supper tonight… and yet, given her health and her age, which is amazing for a feral… I’m also rather hoping she’s at peace and is safe and warm across the Rainbow Bridge now.